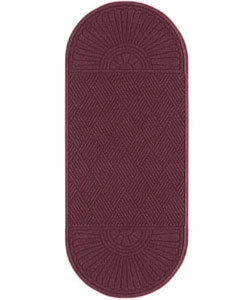 These maroon rounded commercial mats will keep floors clean by absorbing water and mud. The entrance carpets are great for both indoor and outdoor environments and they can easily be cleaned with a hose or vacuum cleaner. Each of the rounded commercial mats is made of durable polypropylene fibers with a rubber bottom that prevents water from spilling out. The flooring are both anti-static and slip resistant for extra safety.